I suppose it was only a matter of time. What was first introduced as a stripped down budget brand has become desirable, and not simply down to its affordable price. 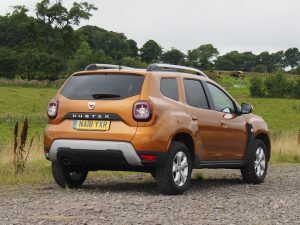 As an entry level on/off roader, the Dacia Duster has become very popular in Scotland, not just because we’re a bunch of cheapskates, and neither is it because of recent snowy winters, but because we appreciate value for money. And that’s what Dacia offers. The previous model didn’t offer much in the way of creature comfort, quality interior trim and high levels of equipment, but what it did offer was a good engine, robust drivetrain and the ability to do what it said on the tin. So to speak. 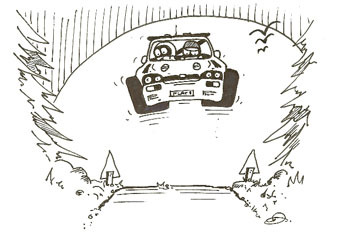 The four wheel drive version was every bit as capable off-road as many vehicles twice and three times its price, while the 2WD version offered the ground clearance and high seating position that others wanted without the need for counting sheep on the wintry high ground. But folk are a fickle bunch, especially car buyers. Having got used to its rather basic charms the call went out for a little bit more in the way of comfort and style. 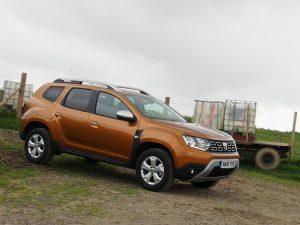 Dacia has responded with the all-new Duster. It now offers four levels of trim, so you can now have your basic model at a cheap and cheerful price or splash the cash and buy a deluxe version, although this is a relative term. 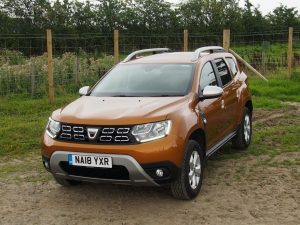 The new Duster range starts at just under ten grand and goes up to just over 16. You also get more car for your money. Although it looks very similar to the old model, all the body panels are new and the car itself is ever so slightly bigger without entering the realms of the large SUV territory. The result is a more attractive, better finished every bit as capable vehicle, and still at an awfy reasonable price. The test car was the near top of the range Prestige 4×4 with the 1.5 litre 109 hp diesel engine. That might sound a bit underpowered but the car weighs just over 1300 kgs, and really that’s all that most folk who buy this machine will ever need. It will do over 100 miles an hour in more enlightened countries and the 0 to 60 dash will take over 12 seconds, but so what? The traffic is so bad in this country these days, that few new cars ever get the chance to stretch their legs whilst traffic lights with cameras on them deter the once common practice of eedjits racing each off the line! Inside the cabin, the new slightly larger seats employ denser foam for improved comfort and support and there is a better sound system. Climate control is available for the first time and the car now comes fitted with Blind Spot Warning, curtain airbags and automatic headlight activation. A first for the Duster. There’s a new electric power steering system that reduces the effort required to turn the wheel by 35 per cent while storage capacity inside the car has been increased by 20 per cent to a total of 28.6 litres. Keyless entry is now available on the top spec cars which automatically opens all the doors as the driver gets close to the car and provides remote locking as they walk away. The 4WD versions are also getting more serious. The high ground clearance of 210 mm is backed up by impressive approach and departure angles of 30 and 33 degrees respectively. Hill Descent Control and Hill Start Assist are now available along with a 4X4 monitor which incorporates a compass and notifies the driver of the vehicle’s angle in real time. A multi-view camera incorporates four cameras (one at the front, one on either side and one at the rear) which allows the driver to view the area around the vehicle. It is also useful to help with parking and is activated automatically when reverse gear is engaged. Towing limit is 1500 kgs which will suit most folk with a medium sized caravan or car trailer. 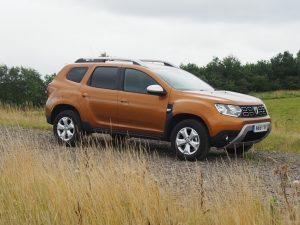 The extra trim inside and new body panels also reduce interior noise levels making the new Duster a much more sophisticated vehicle in its own right. It drives well and is extremely capable off road. I think it’s a great wee car and I’d have one like a shot.